Marvel is ushering in a brand new era for one of its most iconic heroes with the unveiling of a brand new female Thor. The series, which will be written by Jason Aaron and Russell Dauterman is probably the most buzzworthy entry in Marvel’s Avengers Now initiative, which will also see relaunches of Captain America (with Sam Wilson, aka Falcon as Cap) and Iron Man (dubbed, Superior Iron Man), later this month. 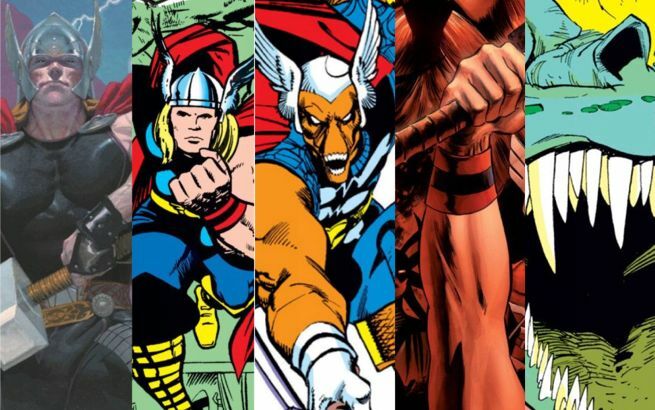 Because of this landmark moment in Thor history, today we take a look at the 10 greatest Thor storylines of all time. An early instance of when Thor’s father, Odin, was a total jerk to the God of Thunder, resulting in some major adversity for our Mjolnir-wielding hero to overcome. In this Stan Lee/Jack Kirby Silver Age storyline, Odin decides to punish Thor for revealing his secret identity to his love, Jane Foster, and for returning to Midgard (Earth) against his wishes. 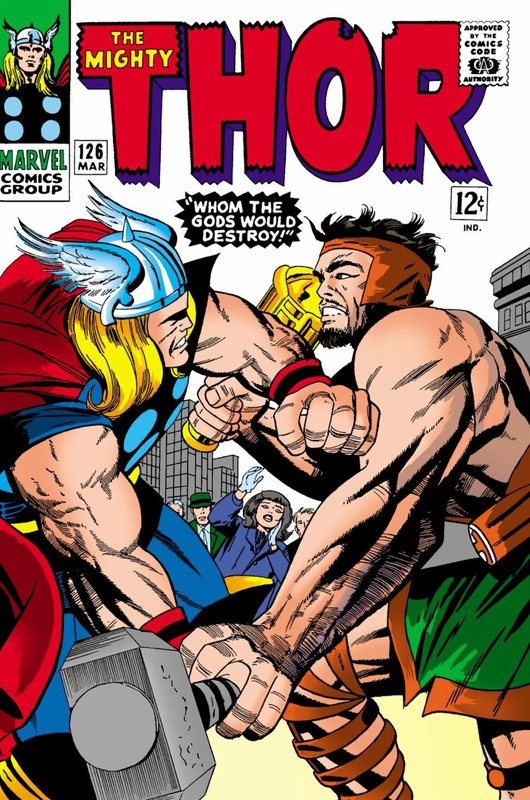 While Thor is battling the powerful Olympian Hercules, Odin drains his son of half his power. As a result, Thor gets his teeth kicked in by Hercules, leaving him humbled and humiliated. In true early-Stan story fashion, Hercules victory over Thor turns him into a celebrity, while Thor is yesterday’s news. He takes Jane’s sympathy to be pity and continues to wallow in his misery. However, he does get a chance to redeem himself in Odin’s eyes, and eventually gets his power restored. Even Hercules is ready to show some respect to Thor when the storyline completes. Overall, the arc is just a great demonstration of some of the quintessential tropes and themes Lee and Kirby used during their Thor run. Thor comics are almost always seemingly at their best when there’s some family drama among the gods. Comic book fans who like their superhero stories on the lighter, funnier, all-ages side of the ledger will undoubtedly gravitate towards this eight-part 2010-11 limited series from Roger Langridge and Chris Samnee. Similar to the Marvel Cinematic Universe’s interpretation of the character, Langridge and Samnee reimagine Thor as somewhat oafish, but undeniably charming fish-out-of-water who finds himself banished to Earth and in the middle of the Oklahoma. The series really shines when it puts its focus on the Thor/Jane Foster relationship/romance. This character dynamic has arguably never been written better, as Langrdige’s script just oozes sincerity and authenticity whenever these two characters share a scene together. And similar to his current work on Daredevil, Samnee’s pencils completely capture the cotton candy tone of this comic. 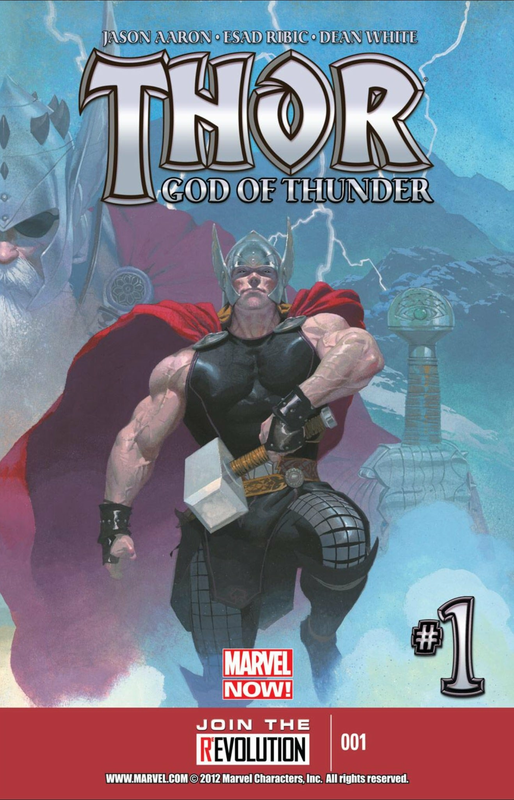 Jason Aaron and Esad Ribic rebooted the Thor franchise as part of 2012’s Marvel Now initiative, kicking the series off with this imaginative 11 issue arc that introduces the terrifying villain, Gorr the God Butcher. The storyline is part murder mystery and part timestream jumping epic. Ribic’s artwork depicting three generations of Thors and the brutality of Gorr is absolutely gorgeous. 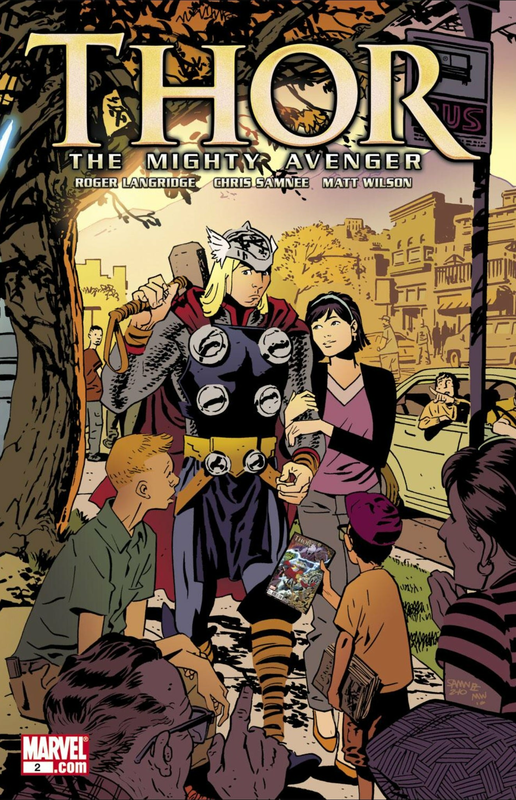 But beyond the action – and if you’re a fan of watching Thor wield a battle axe, as well as the hammer, Mjolnir, this arc is filled with some dynamic sequences – Aaron and Ribic’s story doubles as an insightful look at Thor’s character. By splitting him into three timestreams, we witness Thor the cocky but well-meaning youth; Thor the Avengers we know and love from the comics; and Thor, the spitting image of his father. Despite the distinct differences among these three, all iterations of Thor are completely likeable and are worth cheering for. 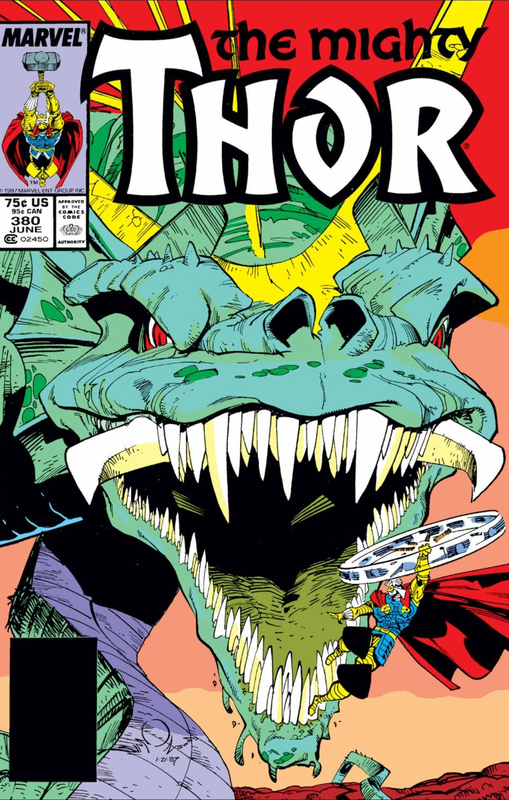 Perhaps one of the most visually stylish and dynamic issues of Thor of all time, in one of the final stories of his iconic run with the character, Walt Simonson scripts and illustrates an entire comic of splash pages as Thor takes on the deadly Midgard Serpent. Adding to the drama, Thor’s bone structure has been weakened by a curse cast on him by Hel, making the odds of him defeating the serpent to appear insurmountable (and making it that much more satisfying when he does succeed). This issue belongs on any top Thor stories list primarily for the risk Simonson takes in composing the comic in such atypical fashion. Keep in mind that the comic book industry was still a few years away from its peak artistic “boom” period when illustrators like Todd McFarlane, Jim Lee and Rob Liefeld would make names for themselves for their incredibly stylized splash and double spread pages. 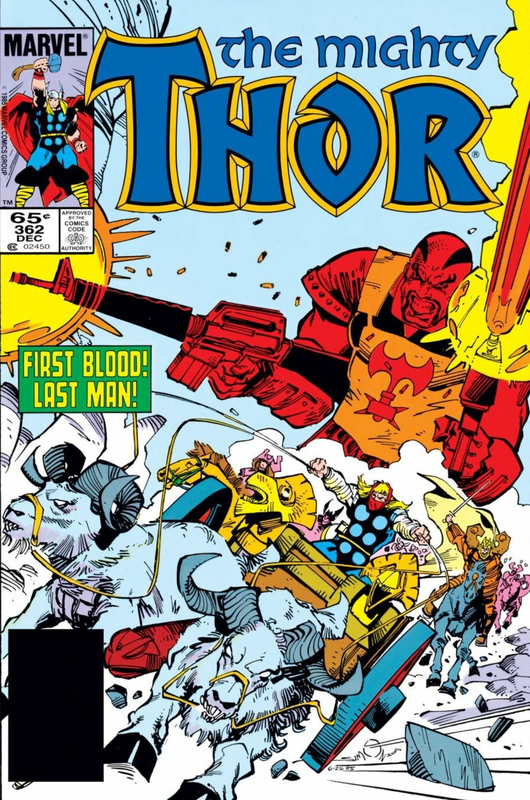 Simonson gets props for not only making Thor #380 look good, but for packing it with an engagingly classic story of a hero emerging victorious despite having the deck stacked against him. 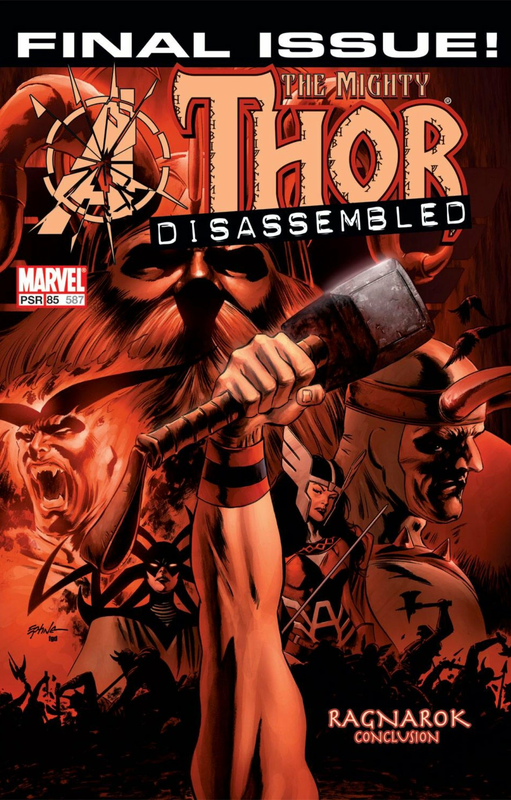 The second volume of Thor ended in absolutely epic fashion as the events of the “Avengers Disassembled” arc spiraled into the realm of Asgard. In this Michael Oeming and Andrea Di Vito story, Thor and Asgard are faced with the coming of Ragnarok, aka, the end of the world in Norse mythology. Of course this wasn’t the first time the gods of Asgard endured such a cataclysmic threat. But it’s the story’s awareness of the seemingly never-ending cycle of world-ending prophecies and events that sets this arc apart from its predecessors. In this story, Thor has the choice of ending this cycle for good and beginning his eternal rest (“eternal” being used fairly loosely here). The depiction of Thor’s choice and its ramifications for himself and the universe feeds directly into one of the more dramatic final chapters of a story arc in Thor comics history. 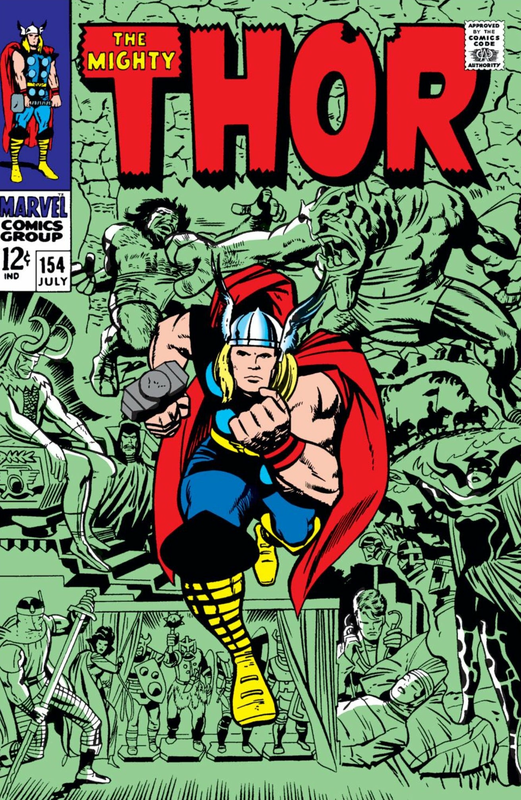 Arguably the pinnacle of Stan Lee and Jack Kirby’s acclaimed run on Thor during the Silver Age, this four-part storyline presents a doomsday/Ragnarok scenario for Thor and Asgard thanks to the introduction of the monstrous Magnog. Magnog is powered by the hatred of a “billion billion beings” – namely his descendants who he alleges were killed by Odin. Despite Thor’s immense power, he can only battle Mangog to a standstill, placing the fate of the universe into peril until Odin is able to resurrect the creature’s kin, thus diminishing the Magnog’s hatred-fueled size and power. The storyline is a textbook example of how Lee and Kirby could create a larger than life threat and make it appear that the odds were too much for the hero to overcome, only to pay off the conflict in satisfying fashion. 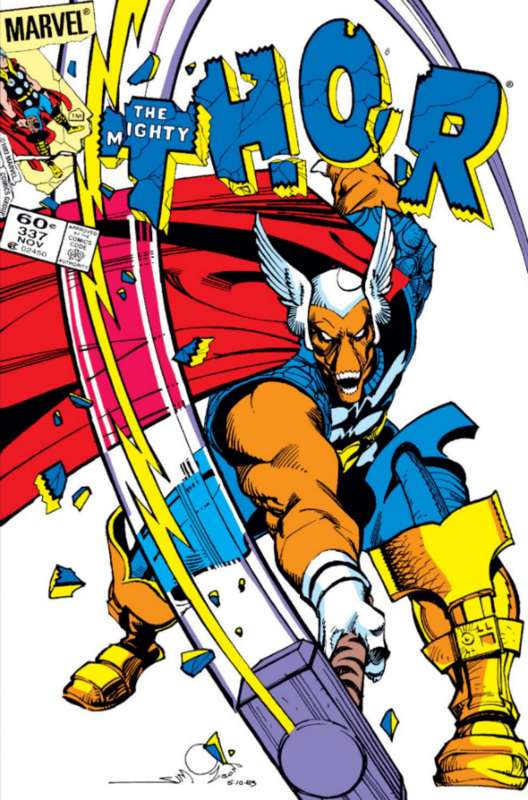 Walt Simonson kicked off his very first arc on Thor by introducing the horse-faced alien Beta Ray Bill – a character that would have a lasting impact on the Thor and Marvel Cosmic landscape. Not only did Simonson shock audiences by having his new character best Thor in his vey first appearance – proving worthy enough to hold Mjolnir to boot – but the writer/artist then went on to add layers of nuance and complexity to Bill’s character, further adding to the alien’s popularity with fans. During this arc, we learn that Bill is one of the last of his kind and only attacks Thor because he believes his race was nearly wiped out via Asgardian magic. But Bill quickly learns of Thor’s integrity, and even refuses to kill the Thunder God despite having the opportunity because he believes Thor to be an honorable individual. As a result of Bill’s own demonstration of honor, Odin presents the alien with his own hammer, Stormbreaker. Bill would hang around the Simonson run to help the Asgardians in their battle against the demonic Surtur (more on him in a bit). 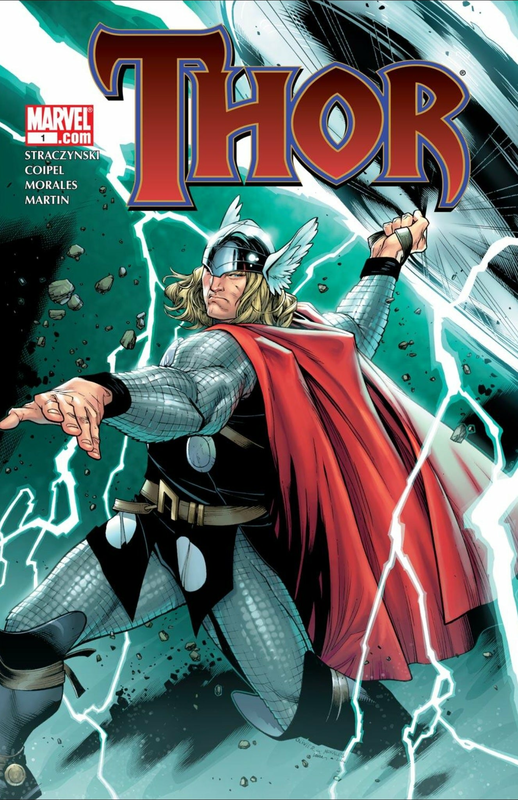 Industry superstar J. Michael Straczynski, alongside artist Oliver Coipel, reintroduce Thor in the Marvel Universe after a nearly three year absence. JMS, who also got a story writer credit for the 2011 Thor film, crafts a phenomenal story that’s a whole new spin on the “getting the band back together” motif. JMS’s first story arc is filled with a number of memorable moments, like Thor floating Asgard over rural Oklahoma as a means to avoid any planning and zoning violations; the Thunder God’s search for Lady Sif (who ends up trapped in the body of a woman dying of cancer thanks to Loki’s chicanery);, and arguably the greatest sequence of them all: Thor absolutely owning Tony Stark after Stark (still living up to his “most hated her of all” moniker thanks to his pro-registration stance during Civil War) approaches his old Avenger teammate about registering his identity with the federal government. JMS and Coipel brought a spirt and verve to Thor that hadn’t been seen on the book/character since the Walt Simonson glory days. If there was a list ranking some of the greatest single issue stories in comic book history, Thor #362, aka, “Skurge’s Last Stand,” would undoubtedly be a contender for the top spot. Yet another entry from Walt Simonson’s magical run on the book in the mid-1980s, this comic features one of the most unexpectedly awesome character moments in Thor history. In this story, Thor and an entourage of Asgardians travel to Hel to rescue some souls from Earth. Among Thor’s group is Skurge the Executioner, a dim-witted C-list villain that before this issue was best known for how he followed the Enchantress around like a love sick puppy. Well, Skurge’s place in the Marvel pantheon of heroes changed quickly when somebody from Asgard needed to hold the bridge out of Hel against Hela’s evil forces. Skurge rose to the occasion and over the span of a few bone-chillingly awesome pages from Simonson, become the stuff of Asgardian and Marvel Comics legends. 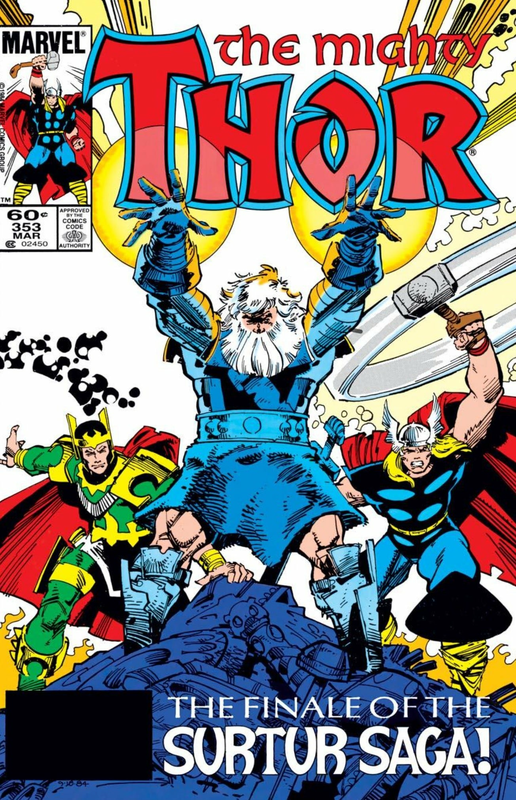 The comic is a perfect demonstration of what made Simonson’s Thor run so iconic – A+ material was distributed to the book’s entire cast of characters, from Thor, Loki and Odin, on down. The fact that an otherwise middling character like Skurge could be believable elevated speaks volumes to Simonson’s talents. Naturally this list ends with another Simonson gem – in this case the story the writer/artist was slowly building over the first two years of his tenure on the title. Bit by bit Simonson teased readers with images of the evil Surtur – all of which accompanied by the ominous sound of “doom.” When the creature is finally at full power, Simonson concludes the arc with a run of issues where both the fate of Asgard and Midgard (Earth) are at stake. Thor #353 is particularly filled with iconic images, whether its Thor, Loki and Odin standing side-by-side, each calling out for how they’re fighting for (Odin: “Asgard;” Thor: “Midgard;” Loki: “Myself’); or one of the final pages that depicts Odin sacrificing himself to defeat Surtur. Despite the storyline's massive impact on the title – Odin would be presumed death for a lengthy period of time, leading to an ongoing storyline where Thor and Loki engaged in a pseudo-cold war over who should rule Asgard – “The Surtur Saga” is yet to be adapted as part of the Marvel Cinematic Universe. Hopefully that changes soon as the arc with its epic structure and scope has all the makings for a classic film.